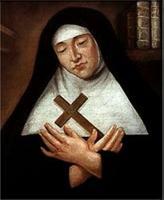 BÉLANGER, DINA (baptized Marie-Marguerite-Dina-Adélaïde), named Marie Sainte-Cécile-de-Rome, Religious of Jesus and Mary, musician, author, and mystic; b. 30 April 1897 at Quebec, only daughter of Octave Bélanger, a bookkeeper, and Séraphia Matte; d. 4 Sept. 1929 at the Couvent Jésus-Marie in Sillery, Que. ; since May 1990 her tomb has been in the chapel of the provincial house of the Religious of Jesus and Mary in Sillery. Dina Bélanger grew up in the parish of Notre-Dame-de-Jacques-Cartier, in Saint-Roch ward in the city of Quebec. She received her elementary and secondary schooling at the convents of Saint-Roch and Jacques-Cartier and at the Pensionnat Bellevue, all of which were run by the Congregation of Notre-Dame. At the age of eight she began music lessons with the nuns, who until 1914 remained her teachers. That year she began studying with Joseph-Arthur Bernier, the organist for the parish of Notre-Dame-de-Jacques-Cartier. Finding that Dina was very gifted musically, he spoke to Abbé Omer Cloutier, the parish priest, who advised her parents to enrol her at the Institute of Musical Art in New York. Thus she attended this conservatory from 1916 to 1918, living at Our Lady of Peace residence with the Religious of Jesus and Mary. She achieved remarkable success in music, particularly with harmony, which requires the kind of mathematical mind she had inherited from her father. On her return to Quebec, Dina lived with her parents, gave brilliant concerts in support of charitable causes at Quebec, and helped her mother as a volunteer in their parish. But the call of Christ, which she had heard from youth, led her to abandon everything and enter the Couvent Jésus-Marie in Sillery on 11 Aug. 1921. She was 24 years old. Assuming the name of Marie Sainte-Cécile-de-Rome, she took her religious vows on 15 Aug. 1923 and went to the Couvent Jésus-Marie in Saint-Michel (Saint-Michel-de-Bellechasse), near Quebec City, where she taught music. She stayed there only five weeks, however. After caring for a sick pupil, she contracted scarlet fever; she had to return to Sillery, where, because she did not have a strong constitution, the disease developed into tuberculosis. From then on, Dina’s life was spent in love and suffering, interspersed with periods of teaching music to young people, who found in her a favoured friend of the Lord. She died on 4 Sept. 1929 at the age of 32, having spent eight years in religious life. It was through her autobiography, written at the request of the superiors of her community and published in 1934 as Une vie dans le Christ, that Dina became known after her death. The account of her human experience and spiritual development revealed her as a mystic, a person who to an unusual degree perceived the presence of God in herself and in the world. According to Pope John Paul II, “She had musical gifts that no doubt prepared her for the acceptance of the divine presence and for praise that transcends words.” From a theological perspective, the mystical life of Dina Bélanger, lived out in the company of the Virgin Mary, was centred on the mystery of love, and the symbolism of the heart serves as a guiding theme to convey this experience. In an original way, she entered into the mystery of the heart of Jesus: the tender or Sacred Heart, in which she at first “hid.” Then, after much inner torment, she was introduced into the Heart of the Trinity, and experienced an intimate union with the Trinity. In a third stage she perceived the mystery of the eucharistic heart of Jesus and his heart in the throes of death, at which time a mission to priests and consecrated persons was entrusted to her by the Holy Spirit. In the fourth and final stage, her life was spent in “the Essence of the Heart of God.” Thus she experienced Christ-centred spirituality: Dina was identified with Christ, her “divine Substitute,” whom she offered unceasingly to the Father in order to bring the redeeming mystery into being on earth. She enriched the church with a broader understanding of the mystery of love, from the doctrinal standpoint of the mystical body and the union of the baptized with the most Holy Trinity. By her prophetic testimony, written at the request of her superiors, she touched young people, parents, priests, consecrated persons, artists, the sick, in short, all those who, looking upon her, opened their hearts to love. After her death, many favours were obtained through her intercessions, and diocesan proceedings for her beatification began at Quebec in 1939. She was beatified in Rome on 20 March 1993. The first prospective saint to be born in Quebec, the cradle of French Christian civilization in North America, Dina Bélanger followed in a long line of spiritual souls and mystics, most of them from France, who for 350 years had brought glory to the country. Though her whole life was inward and hidden, she deserves a place alongside the great mystics of its early days, including Marie de l’Incarnation [Guyart*], Marie-Catherine de Saint-Augustin [Simon*], and Marguerite Bourgeoys*. In her, the “spiritual springtime” of the country is reborn. The archival records concerning Dina Bélanger were unfortunately destroyed in a fire at the Couvent Jésus-Marie at Sillery, Que., in 1983. After Bélanger’s death, the authorities of her community had had her manuscript journals transcribed and had turned them over to Dom Léonce Crenier for publication. The resulting text appeared as Une vie dans le Christ: Marie Sainte-Cécile de Rome (Dina Bélanger), religieuse de Jésus-Marie (1897–1929); autobiographie et témoignages (2v., Sillery, 1934). This work has since gone through five French editions and as many in English, and has also been translated into several other languages. Among the many books and articles devoted to Dina Bélanger, a partial listing of which appears in Congregatio Pro Causis Sanctorum, Beatificationis et canonizationis servae Dei Mariae a S. Caecilia Romana (in saec. Dinae Bélanger), sororis professae e Congregatione religiosarum Iesu et Mariae (1897–1929); relatio e voti del congresso speciale, 25 ottobre 1988 (Rome, 1988), the following are of particular note: Ghislaine Boucher, Dina Bélanger, Marie Sainte-Cécile-de-Rome, 1897–1929; itinéraire spirituel (Montréal, 1983); H.-M. Guindon, Toute à toi; Marie dans la vie spirituelle de la vénérable Dina Bélanger (Montréal, 1989); Irène Léger, Courage d’aimer: Dina Bélanger, religieuse de Jésus-Marie (en religion Marie Ste-Cécile de Rome), 1897–1929 (Montréal, 1986); Fernand Ouellette, Dina Bélanger (Saint-Laurent, Qué., 1998). Ghislaine Boucher, “BÉLANGER, DINA, named Marie Sainte-Cécile-de-Rome,” in Dictionary of Canadian Biography, vol. 15, University of Toronto/Université Laval, 2003–, accessed April 21, 2019, http://www.biographi.ca/en/bio/belanger_dina_15E.html.